I'm especially happy with this painting. Using enough paint to go around is so important! Also mixing more/different for in between areas. A few of you have asked about calendars. I opted out of self publishing this year... But you can still get one! The Current Catalog is offering a 2019 calendar of my paintings titled "The Painted Cat." It's remarkably less expensive than the ones I make myself. Also of note they go on sale November 5th bringing the price down ever further! Here's a link. Got the calendar! Thanks for the link. 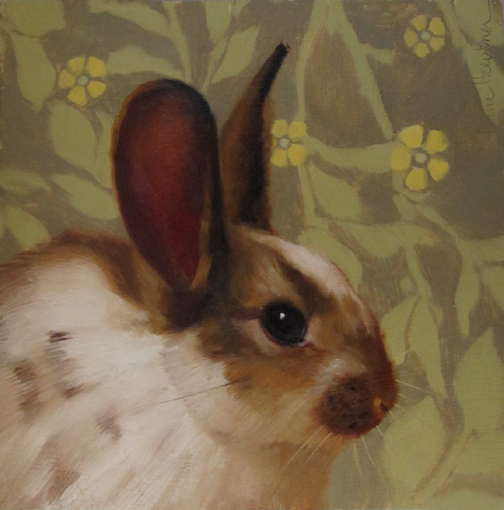 Love the bunny, excellent painting. Funny thing about bunnies..... they can be very imperious and haughty. It's hilarious to see a 3 pound furball stamp their feet with displeasure! " I am displeased, human!" lol and I thought cats had a 'tude. Lol, that is true!! I had a pet bunny growing up and they WILL get an attitude. They still cute, but dang?! Thank you for the calendar purchase.